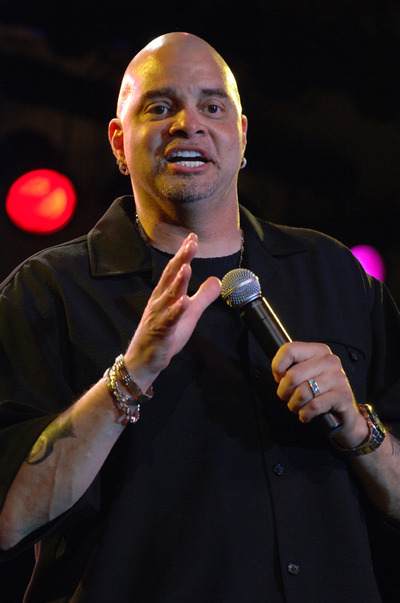 David Adkins (born November 18, 1956)—known by his stage name Sinbad—is an American stand-up comedian and actor. He became well known in the 1990s from being featured on his own HBO specials, appearing on several television series, and starring in the films Necessary Roughness, Houseguest, First Kid, Jingle All the Way and Good Burger. Sinbad was born David Adkins from Benton Harbor, Michigan on November 18, 1956, the son of Martha and the Baptist Rev. Dr. Donald Adkins. He has five siblings, named Donna, Dorothea, Mark, Michael, and Donald. Sinbad attended Benton Harbor High School, where he was in the marching band as well as the math club. He attended college from 1974 to 1978 at the University of Denver in Denver, Colorado, where he lettered two seasons for the basketball team. Sinbad served in the United States Air Force as a boom operator aboard KC-135 Stratotankers. While assigned to the 384th Air Refueling Wing at McConnell Air Force Base in Wichita, Kansas, he would often go downtown to do stand-up comedy and competed as a comedian/MC in the U.S. Air Force's Talent Contest in 1981. Sinbad was almost dismissed with a dishonorable discharge for various misbehaviors, including going AWOL. After a series of incidents, he was eventually discharged "for parking my car in the wrong position." Under the professional name Sinbad, which Adkins chose out of admiration for Sinbad the Sailor in order to stand out in the entertainment industry, he began his career appearing on Star Search. Sinbad won his round against fellow comedian Dennis Miller, He soon was cast on The Redd Foxx Show, a short-lived sitcom, playing Byron Lightfoot. Sinbad was known for keeping his act clean and was devoid of derogatory statements or foul language, which he felt was not necessary to sell a crowd and continue to make them laugh. In 1987, Sinbad landed a role in A Different World, a spin-off of The Cosby Show built around Lisa Bonet's character Denise Huxtable. Previously, Sinbad appeared in two different one-off roles on The Cosby Show, as the principal at Huxtable's college and as "Davis Sarrette". While Bonet only stayed with the program for a season, Sinbad stayed with the cast from 1988 until 1991 as "Coach Walter Oakes". Sinbad married Meredith Fuller in 1985. They have two children together. The couple divorced in 1992, then remarried in 2002. Sinbad is currently training in tae kwon do.